The effective production price per MWh from the simulation is then compared to the average industrial power price for each of the EU-member states in order to evaluate the effect of an EU-wide carbon tax on end-users. The optimal portfolio recommended by the simulation, in conjunction with transport via a Pan-European SuperGrid, will be able to supply power at a similar (±5%) price to the current EU 27 average while dramatically reducing greenhouse gas emissions. 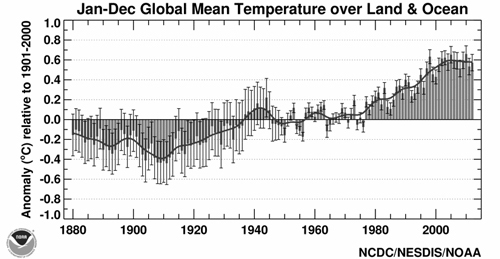 Over the past 100 years the global temperature has risen 1.53 °F. However, since ocean temperature tends to rise slower than land, the overall effect is more pronounced for Earth's landmasses. While there are those who contest the science, the vast majority of climatologists attribute this sustained rise in global temperatures to the increased use of fossil fuels for transportation and power. 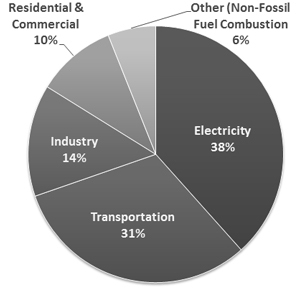 In the US, the largest source of these CO2 emissions come from the generation of electric power followed by transportation. While no similar data could be found for the EU, Europe's lower car-utilization rate suggests that its percentage of CO2 emissions from electric generation is higher than that of the US (global average from electric generation is roughly 1⁄3). Clearly, if the EU, and the world, are serious about reducing greenhouse gas emissions, we will have to make changes to the way we generate electric power. Currently there is no EU-wide carbon tax. In the 1990's a carbon tax was proposed to the EU Parliament, but this measure failed. However, in 2005 the EU began its emissions trading scheme (EU ETS), commonly referred to as "cap and trade". Under the EU ETS a maximum allowance of greenhouse gases (GHG) is set for each of the 11,000 plants under the regulation. If the operator emits more than its allotted amount of carbon, it is forced to buy carbon permits from other users on the market, thus constraining the aggregate emissions level (European Commission, 2013). Opponents of carbon taxation argue that it is a regressive tax, since it will disproportionally hurt lower-income households. A tax on carbon would cause production costs of electricity to rise, a cost that would ultimately be passed on to the consumer. Assuming all users are charged the same rate for power, the rate increase would represent a larger share of lower-income families income. Additionally, more affluent families are able to afford the upfront capital expenditure associated with buying new, energy efficient appliances, LEED Certified homes, home solar panels, etc. while poorer household will remain reliant on electricity-produced from burning fossil fuels. Theoretically, both the Cap and Trade and a carbon taxation scheme will achieve the same outcome of reducing GHG emissions, however in practice they behave quite differently. In the EU, all existing power stations were issued a base carbon allowance for free, essentially making the scheme free for them as long as they maintained current emissions levels. On the other hand, a carbon tax will impose immediate costs on all emitters as each unit of carbon has a price. This helps explain why this program was able to pass the ballot while taxation was not (Taschini, 2013). Carbon taxation is more difficult to implement because the price at which it is taxed at is extremely important– too low and industry might just pay the tax and continue emitting GHG, too high and consumers suffer dramatically higher prices. It is this pricing problem that this paper centers on. Electric power demand is predicted to increase in Europe as more and more tasks traditionally fulfilled via internal combustion (IC) or natural gas (e.g. transport and home heating) become electric. This in-and-of itself is good– large-scale electric generation is much cleaner and energy efficient than IC, however this will force governments and utility companies to build new generation stations. New power plant construction in-turn raises the question of what type of power plants the EU should invest in. 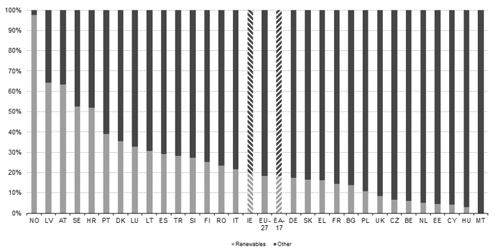 Europe varies greatly when it comes to the methods used to generate electricity. Norway, produces over 90% of their power from renewable sources, while others such as Malta produce almost 0% of their power using renewables. Overall, the EU 27 stands at about 18% generation from renewables. Between 1990 and 2008, the share of electricity produced from renewable sources increased by 288 TWh, an increase of 87.2% (European Environmental Agency, 2011). As seen in Figure 4 for the vast majority of European nations, electric power is produced primarily by conventional thermal, i.e. burning a fuel to produce heat. 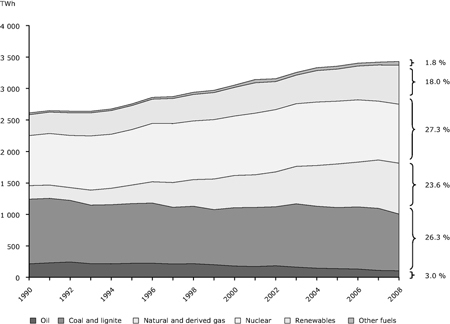 Traditionally this has meant coal and oil, but increasingly the world has shifted towards nuclear and natural gas as its main heat sources. As we will see, the various methods of producing this heat have dramatically different environmental impacts. 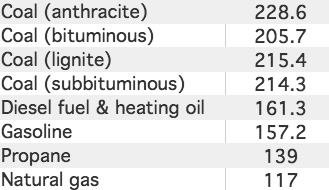 As seen above, natural gas produces about 57% less CO2 than bituminous coal (the most commonly used for electricity generation). Thus, it follows that replacing all existing coal power plants with natural gas would reduce GHG emissions by over half! Capacity factors have large implications on the optimal energy portfolio since a certain base load of power will be needed at all times. This suggests that a global optima of cost and emissions exists since a grid comprised completely of renewables would require a nominal capacity of three times the actual requirement– a three-fold cost increase. This paper aims to find the Pareto optimal combination of cheap, reliable, polluting thermals with expensive, intermittent, and clean renewables. The intermittent supply of solar and wind power raises concerns about the stability of the grid. This intermittency, coupled with the unequal demand, could cause blackouts if supply was at a low while demand was at a high (around 4pm). Conversely, if there is not enough demand to meet the supply, blackouts could be caused by wind turbines overloading the transmission lines. Transmission lines, like highways, are limited by their capacity, and large surges of energy can cause them to overload and shutdown, which can potentially cause nationwide voltage drop and subsequent blackout (Cardwell, 2013). 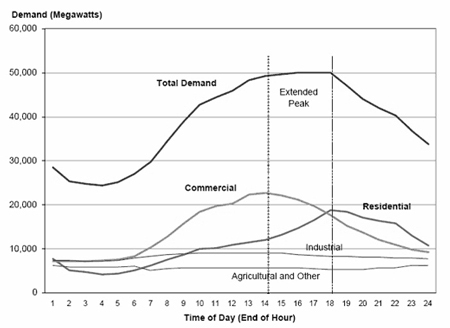 A typical grid operator will want a base load, supplied by nuclear, coal, or natural gas, of around 50% of peak demand. This way, when the wind blows or the sun shines; there is still a demand node for the generated power to go to. However, since these renewable sources are intermittent, utility companies specify a certain percentage of dispatchable reserves (DR), which can be turned on, should there not be adequate renewable generation to satisfy demand. Gas turbine engines ordinarily generate these reserves. Usually, this reserve ratio is around 70%. Once again, we will see how the intermittent nature of renewable generation technologies effects the optimal energy portfolio as the cost of building a wind or solar installation must also include a the cost of a fractional dispatchable installation. EIA. "How Much Carbon Dioxide (CO2) Is Produced When Different Fuels Are Burned?"" U.S Energy Information Administration. U.S Energy Information Administration, n.d.Web. 9 Dec.2013. Habb, Tim, and John Whitehead. "Econ 101: Carbon Tax vs. Cap-andTrade." Environmental Economics. N.p., n.d. Web. 9 Dec. 2013. Tashini, Luca, Simon Dietz, and Naomi Hicks. 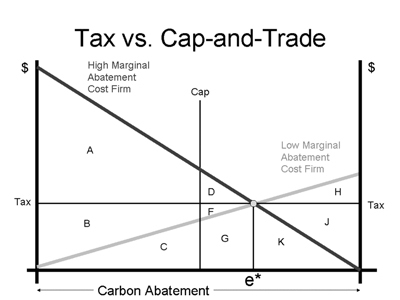 "Carbon Tax v Cap-andTrade: Which Is Better?" The Guardian. N.p., n.d. Web. 9 Dec. 2013. European Commission. "The EU Emissions Trading System." Europa. European Commission, n.d. Web. 9 Dec. 2013. PBS. "Sources of World's CO2 Emissions." Frontline. Public Broadcasting Station, n.d. Web. 9 Dec. 2013. EPA. "Overview of Greenhouse Gasses." EPA. United States Environmental Protection Agecy, n.d. Web. 9 Dec. 2013. UCAR. "How Much Has the Global Temperature Risen in the Last 100 Years?" University Corporation for Atmospheric Research. UCAR, n.d.Web. 9 Dec. 2013. Plumer, Brad. "What Happens if You Add Lots ofWind and Solar Power to the Grid?" The Washington Post. The Washington Post, n.d. Web. 9 Dec. 2013. Wind Energy Center. "Wind Power: Capacity Factor, Intermittency, and What Happens When the Wind Doesn't Blow?" Wind Energy Center. University of Massachusetts Amherst, n.d. Web. 9 Dec. 2013. Puka, Lidi, and Kacper Szuleki. "Plans to Create a Pan-European Electricity Grid as Part of the Common Energy Market Face a Number of Challenges Before They Can be Realised." London School of Economics. LSE, n.d. Web. 9 Dec. 2013. Andrews, Dave. "Why Do We Need The Supergrid, What Is Its Scope And What Will It Achieve?" Claverton Energy. Claverton Energy, 9 June 2009.Web. 9 Dec. 2013. While technically coal and nuclear are dispatchable, they are more traditionally used to supply base loads since they take more time (days) to ramp up. Aeroderivative gas turbines are the ultimate dispatchable because their production can be started and stopped in a matter of hours. Often cited as "its always windy somewhere"
Hydroelectric is highly represented because it is has a relatively high capacity factor and is semi-dispatchable. While the maximum output is limited by the flux of water, it can be adjusted down from this maximum by gearing the connection between fan and generator shaft. Industry was used instead of household since it more closely follows the cost of electric production for utility companies. Since the data modeled is based on production, this was deemed prudent.